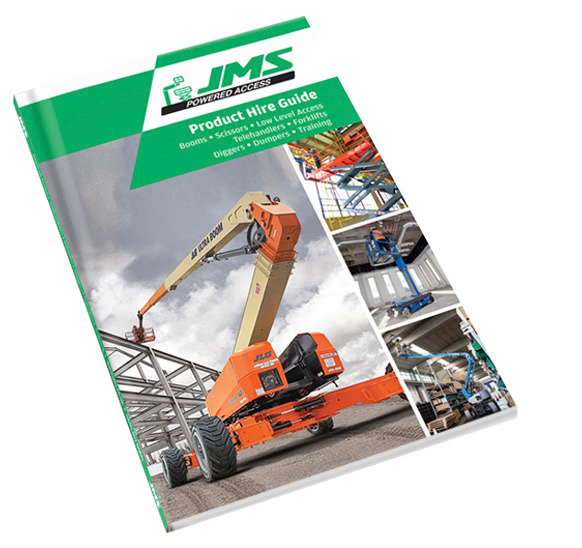 JMS is now offering the option for Damage Waiver cover when hiring access equipment to it’s new and existing customers. 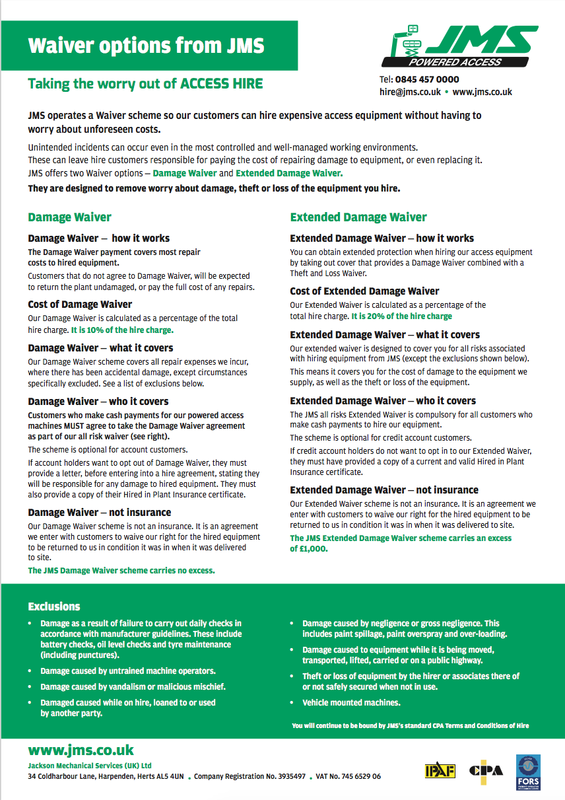 Damage Waiver is a simple scheme that prevents customers paying unforeseen charges that arise from accidental damage, theft or loss of expensive access equipment. It is a requirement when hiring powered access to have adequate cover for such an event. Damage Waiver from JMS takes away the need for customers to check and negotiate additional cover with their insurance company, or be faced with expensive repair costs. When hiring from JMS, new and existing customers can choose one of two waiver options: Damage Waiver or Extended Damage Waiver. The Damage Waiver payment covers most repair costs to hired equipment. Customers that do not agree to Damage Waiver, will be expected to return the plant undamaged, or pay the full cost of any repairs. Our Damage Waiver is calculated as a percentage of the total hire charge. It is 10% of the hire charge. Our Damage Waiver scheme covers all repair expenses we incur, where there has been accidental damage, except circumstances specifically excluded. (See the list of exclusions). Customers who make cash payments for our powered access machines MUST agree to take the Damage Waiver agreement as part of our all risk waiver (see right). The scheme is optional for account customers. If account holders want to opt out of Damage Waiver, they must provide a letter, before entering into a hire agreement, stating they will be responsible for any damage to hired equipment. They must also provide a copy of their Hired in Plant Insurance certificate. Our Damage Waiver scheme is not an insurance. It is an agreement we enter with customers to waive our right for the hired equipment to be returned to us in condition it was in when it was delivered to site. The JMS Damage Waiver scheme carries no excess. You can obtain extended protection when hiring our access equipment by taking out cover that provides a Damage Waiver combined with a Theft and Loss Waiver. Our Extended Waiver is calculated as a percentage of the total hire charge. It is 20% of the hire charge. Our extended waiver is designed to cover you for all risks associated with hiring equipment from JMS (except the exclusions). This means it covers you for the cost of damage to the equipment we supply, as well as the theft or loss of the equipment. The JMS all risks Extended Waiver is compulsory for all customers who make cash payments to hire our equipment. The scheme is optional for credit account customers. If credit account holders do not want to opt in to our Extended Waiver, they must have provided a copy of a current and valid Hired in Plant Insurance certificate. Our Extended Waiver scheme is not an insurance. It is an agreement we enter with customers to waive our right for the hired equipment to be returned to us in condition it was in when it was delivered to site. The JMS Extended Damage Waiver scheme carries an excess of £1,000 for Theft and Loss claims. Please note that exclusions do apply. All customers will continue to be bound by JMSs standard CPA Terms and Conditions of Hire. 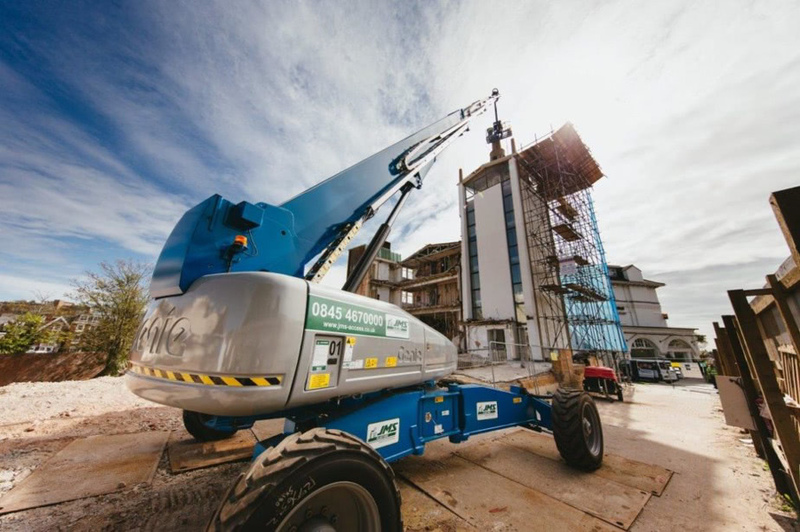 JMS offer powered access hire nationally. With depots in Harpenden, Hertfordshire, Leeds, West Yorkshire and Pinewood Studios, Bucks. For more information about Damage Waiver options, contact JMS today on 0845 457 0000 or email hire@jms.co.uk.